From this tutorial you’ll learn how to utilize Pricing Table JetElements module style for Elementor. Here you can customize the pricing table style. Background Type — in this block you can choose, whether you want to use classic or gradient type for the pricing table background. The customization options vary for each type. Border Type — here you can define the type of the border you need to use for the element. In this block you can apply custom colors and typography settings to the pricing table header. Background Color — here you can define the suitable color for the header background. Use color picker tool to select the necessary color. Title Color — here you can define the suitable color for the header title. Use color picker tool to select the necessary color. Subtitle Color — here you can define the suitable color for the header subtitle. Use color picker tool to select the necessary color. Typography — turn the option on to view the typography settings. The typography settings are similar for Title, Subtitle, Pricing, Features, Action Box and Action Button blocks. Here you can customize Icon color, font size, box size and icon background color. Font Color — here you can set icon font color for the module using color picker tool. Icon Font Size — in this block you can define the size of the icon digit (the maximum size is 200 px). Box Size — in this block you can define the size of the icon box (the maximum size is 200 px). Border Type — here you can define the type of the border you need to use for the icon. Box Shadow — enable this option if you want to access the shadow advanced settings for the icon, and need to apply shadow for it. Alignment — here you can define the preferable alignment. The element can be placed to the left, to the right, or remain centered. 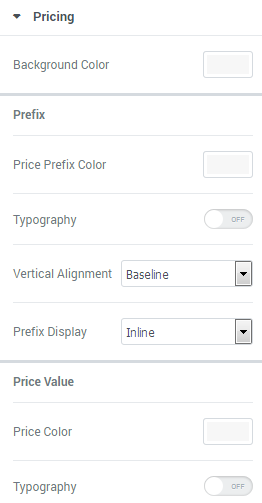 In this block you can apply custom appearance settings to the pricing background, prefix, values and suffix typography, and colors. Background Color — here you can select the color to use it for the pricing general background. Price Prefix Color — here you can select the preferable color for the price prefix. Suffix Color — here you need to specify the color of the price suffix. Price Color — in this block you can define the color to use for the price. Vertical Alignment — here you can define the specifics of the prefix vertical alignment. Prefix Display — here you can define if you want the prefix to be displayed inline, or as a separate block. Suffix Display — here you can define if you want the suffix to be displayed inline, or as a separate block. In this block you can customize pricing table features, such as features background color and alignment. Background Color — here you can define the background color to use it in the features background. Alignment — here you can define the preferable features alignment. The features can be placed to the left, to the right, or remain centered. Included (Excluded) Feature Color — here you can specify the color for the excluded and included features. Included Bullet Icon — here you can define the icon to use for the included features. Excluded Bullet Icon — here you can select the icon you want to use for the excluded features. Text Decoration — for the excluded features you can enable such text decoration element, as a line through. Bullet Color — here you can select the color you want to use for the included or excluded features icons. Icon Size — here you can define the size of the excluded of included features icons. Features Divider — enable the option if you want to separate features using a divider to make them stand out. Divider Style — here you can select the style to use for the divider. It can be solid, double, dotted or dashed. You can also define the weight, the width and the gap for the divider using the corresponding controls. In this block you can customize the Action Box elements, such as action box background, typography, etc. Background Color — click on the option to define the suitable color for Action box background. Price Prefix Color — here you can set the color to use it for the price prefix in the Action Box. Alignment — here you can define the preferable action box alignment. The content of the Action Box can be placed to the left, to the right, or remain centered. In this block you can apply custom appearance settings for the button background, button text, change text typography, etc. Background Color — here you can select the suitable background for the Action button. Text Color — use color picker tool to set the preferable color for the button text.